One of the strengths of the plane was a Ukrainian designed AI-222-25 engine created by Ivchenko-Progress SOE. The engine was subsequently produced by Russia’s Salyut Scientific-Production Centre for Gas Turbine Construction, in accordance with a license agreement between the Ukrainian and Russian enterprises. In 2015, when the license agreement expired, Irkut Corporation, the manufacturer of the Yak-130 should have changed the aircraft’s main propulsion system, but instead the company simply breached the copyright of the Ukrainian design for the engine, and started its own production of spare parts to replace the original Ukrainian components. At the same time, Russian media also began to spin reports claiming the successful and full replacement of Ukrainian components for the Yak-130 engines by the Moscow-based Salyut factory. But there were operational problems with regard to the reliability of the newly copied engines. On September 16, 2017, a Yak-130 crashed near the airfield in Borisoglebsk (Voronezh Region) during a training flight. The crew ejected. Media reports suggested that a possible cause of the crash was an abrupt failure of the engine systems. On April 12, 2018, also in Borisoglebsk, a second Yak-130 crashed. During a scheduled training flight, the plane experienced a technical malfunction of one of the units. Both pilots ejected. Not only is the Russian manufacturer in violation of the license agreement for the use of Ukrainian engines, they are also producing Yak-130s with engines that have not been upgraded and which lack the necessary quality of technical maintenance up to the standards required by the original design bureau. This poses a potential safety threat not only to Russia’s own air force, but also to aviation security worldwide. Notwithstanding the reported incidents and question marks over the reliability of the copied engines, Russia has been promoting the Yak-130 aircraft to foreign markets. 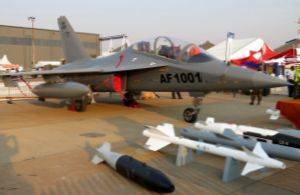 In 2018 alone, the aircraft was showcased for example at Indo Defense 2018 (Indonesia), FIDAE 2018 (Chile), and EDEX-2018 (Egypt), amongst other international arms exhibitions. However, top officials in Russia, including former Deputy Prime Minister Dmitry Rogozin, have expressed dissatisfaction with the Russian aircraft engine producers, saying that they lag behind their competitors. Competitor models to the Yak-130 include the Chinese manufactured Honhdu L-15 and the Italian Aermacchi M346. According to aviation experts the latter surpasses the Yak-130 in terms of its lightness and aerodynamic profile. 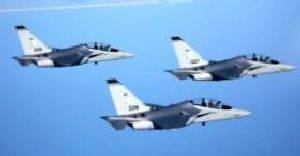 The U.S. Air Force is reported to be now reviewing the possibility of purchasing the Aermacchi M346.